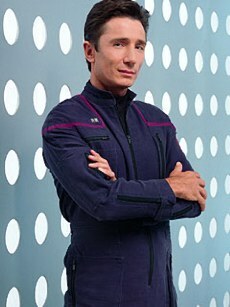 Lieutenant Reed is played by Dominic Keating. Lt. Malcolm Reed is the Armory Officer of the Enterprise. He is a British, by-the-book officer with a vast knowledge of weaponry. He is shy and awkward when it comes to affairs of the heart. His favourite food is pineapple (Silent Enemy). Reed is descended from a long line of British navy men; in fact, he takes after his grandfather who was an ordnance officer in the Royal Navy. He is the 22nd Century's version of a "regular army guy." Rules and regulations, discipline, schedules; life is strictly by-the-book for this British officer who is fascinated by munitions and what he can create next in his lab. Around women, however, he becomes soft-spoken and tongue-tied. Mr. Reed has a variety of allergies, including dust mites, oak pollen, tropical grasses, and various plant enzymes including bromelin. Over the last several years he has taken regular injections so that his body can tolerate bromelin, in order to partake in one of his favorite foods, pineapple.